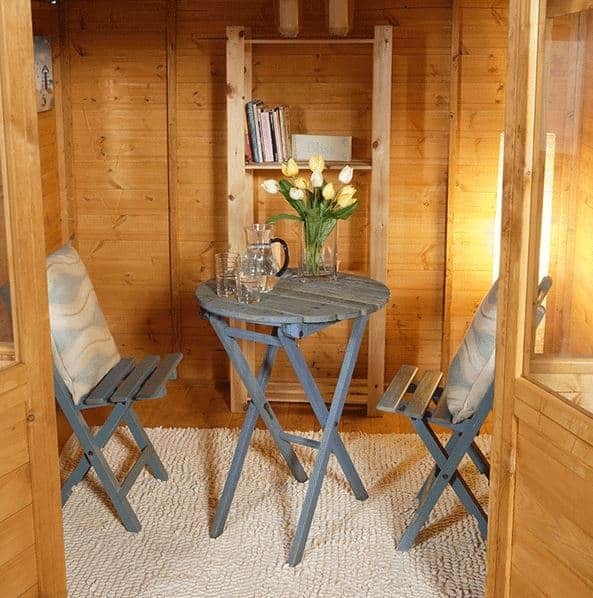 Stylish, classy, smart and just down right cool are all ways that you could describe the fantastic Hartwood 8′ x 8′ FSC Chadbury Summerhouse. This is one very well made and amazing looking structure that is sure to give you many years of fun. It offers you a great place to relax for a few hours after work or even as a nice place to sit down and enjoy the paper on a Sunday morning. Its very elegant design will make it a stand out feature of your garden. The summerhouse in general has a very high quality look, with its decking area, overhang and large double doors giving it a very friendly and welcoming appearance. 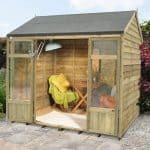 As well as being a summerhouse that is very attractive, this one here is also very well made and is constructed with some of the finest materials a summerhouse can be. This starts with the smooth and gorgeous looking tongue and groove shiplap cladding. This is strong as it is 12 mm thick, but it is also backed up with a very well made and robust frame. The roof is constructed with some very strong tongue and groove boards and this same kind of high quality boarding is what they have used for the flooring as well. 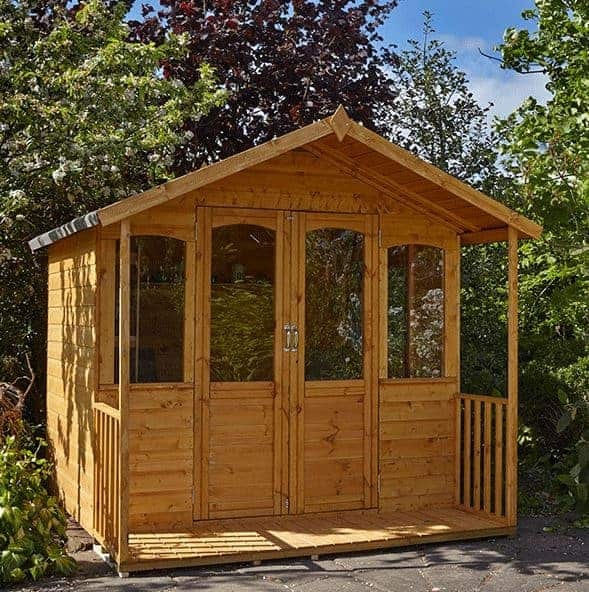 With a very classy and high quality look as well as design, the Hartwood 8′ x 8′ FSC Chadbury Summerhouse is one of the smartest looking summerhouses that we have seen. They really have managed to make this look like a high class log cabin that you would find on some overpriced resort. 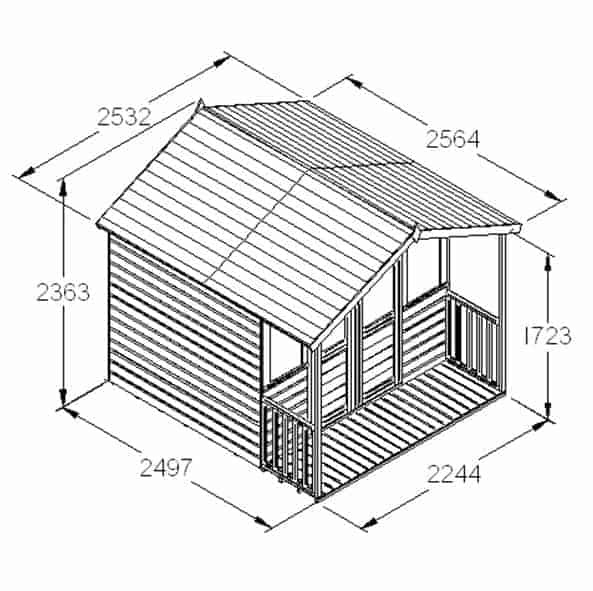 The summerhouse is not one of the larger summerhouses, but actually we do feel that works to its advantage as most gardens will be able to fit this in. The depth is 8 feet 6 inches and the width 8 feet 4 inches so you have a fairly decent amount of floor space inside the summerhouse to make use of. Along the ridge the height of the summerhouse is 6 feet 7 inches which is what we consider to be a very nice amount of headroom. Even the roof of this summerhouse is very high quality as they have used impressively strong and gorgeous looking tongue and groove boarding. This is able to take a lot of weight and is protected on the outside by some strong, green mineral felt. It also means that on the inside, you have some very attractive boarding above your head. The roof does extend out over the front of the summerhouse with this lovely overhang which we really like. Keeping your furniture and other belongings safe from the rain and the other things that will be thrown their way, is some very sleek looking, tongue and groove shiplap cladding. At 12 mm thick, we feel that this kind of cladding is just as strong as it is easy on the eyes. The cladding is made so that it is slotted together so tightly that it is just impossible for water to get into the summerhouse. Inside the summerhouse is a 35 mm x 28 mm frame that is connected to the tongue and groove cladding in a very special kind of way. They have really managed to make the frame and cladding connected together so well that it makes this summerhouse incredibly robust. The way the frame and cladding come together is one of the major reasons that this summerhouse is going to give you so many years of use. There is some extra framing which is used on the outside of the summerhouse to make sure the overhang is supported. 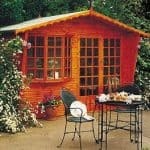 We really like this as it not only looks fantastic, but it also helps make the summerhouse that little bit stronger. Tongue and groove boarding has been used for the floor and this is something we are really happy to see as it makes the floor very strong and it also looks amazing. This kind of flooring is able to take a lot of weight and they have also been very smart with the kinds of floor joists they have used as well. Outside the summerhouse is this very nice looking decking area that is made with some well spaced out planks which add a lot of personality to the summerhouse. 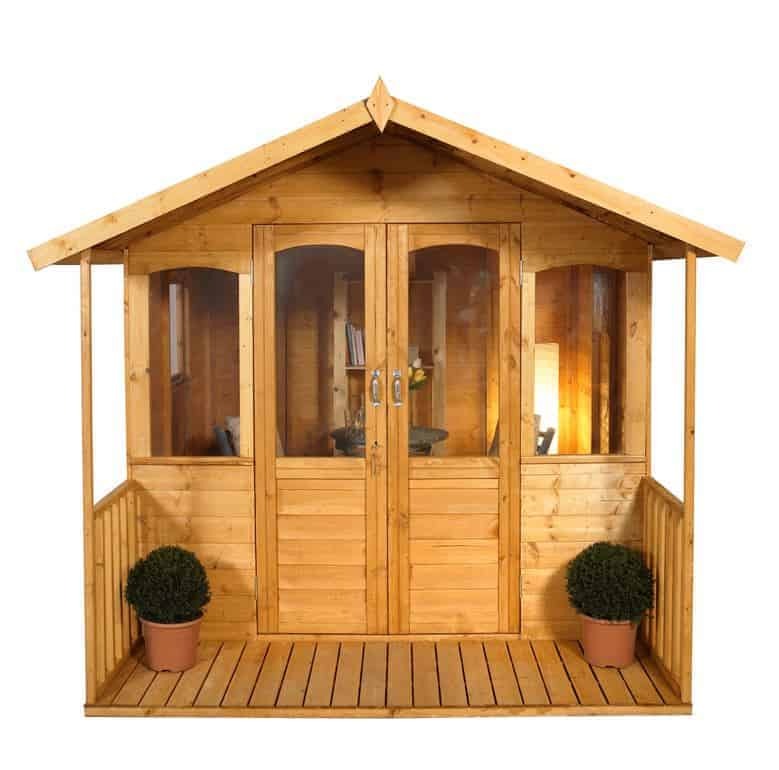 Clearly the Hartwood 8′ x 8′ FSC Chadbury Summerhouse is one of the most attractive looking summerhouses out there right now and the last thing you will want is a couple of years down the line for this to look all rotted and ugly. Well in order to achieve this a coating of wood treatment will have to be applied shortly after you have installed the structure and then also once a year after this. 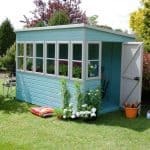 As long as you treat the summerhouse on an annual basis and in general look after it properly, then you will be covered by a generous 10 year anti rot guarantee. The double doors on this look fantastic. At 3 feet 9 inches wide they are not the widest double doors we have seen, but they still offer more than enough room to get your belongings in and out of the summerhouse. Each door is made with strong timber and they both have a very cool looking window as well as their own old school style door handle. As well as the two windows that are on the doors there are another two windows on this summerhouse. They are positioned next to the doors and are made with 1.2 mm thick anti shatter styrene which actually is what all the windows are made from. The windows are all a very good size so you will get plenty of light in the summerhouse. A very smart, press lock is included with this summerhouse and we really like that as it make locking up the summerhouse very easy. You could of course add an extra hasp and staple with a padlock if you did want to add a little bit more security. We know that the front of the summerhouse is wide open for viewing with those large windows, but actually we are not concerned by this and feel that the privacy this offers is fine and certainly in line with what other, similar sized summerhouses are offering. This is a summerhouse that would look great in a number of different colours so have a little think about using a coloured wood treatment. Also you could always use a hanging basket of some kind on the overhand and that decking area would look awesome with a small chair or a couple of potted plants. The design of the summerhouse really does let you flex your creative muscles as there are many areas where you can apply your own personal touch. The only extra to consider is a 8′ x 8′ Ecobase Plastic Shed Base which we really do like as it can greatly help the flooring of the summerhouse. However, at £161.99, we do feel that it is a little on the pricy side and it is not actually something that many people would find they need. Still if you do have some concerns over the surface where you will be installing the summerhouse then at least have a think about this plastic shed base. 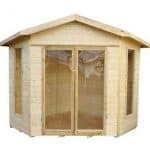 This is a summerhouse where we really could not be any more impressed with the overall quality. We tip our hats to the designers of this summerhouse as they really have done a wonderful job. You will have to give this a little bit of TLC over the years, but the payoff for doing this is a summerhouse that is going to last for lots and lots of years. 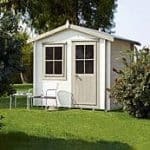 The size is the only issue that we can see people having with this summerhouse and while it is not one of the larger ones we have seen, we do like how its rather compact size allows for gardens of all sizes to enjoy this. When it comes to installing this summerhouse be sure to take your time, have a helper whose personality you can tolerate for around 6 hours and have plenty of snacks and drinks on the go. This is not going to be all that hard of a job as long as you follow the instructions and try not to rush it. 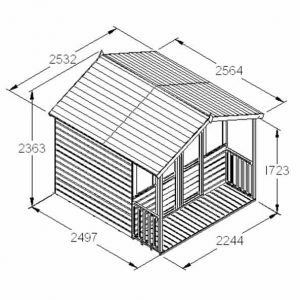 This is one of the more expensive 8 x 8 summerhouses we have seen, but because of the high quality and the incredible good looks we still feel that this is offering good value for money. Final Thoughts: We knew that the Hartwood 8' x 8' FSC Chadbury Summerhouse was a special kind of summerhouse the first moment we saw it. 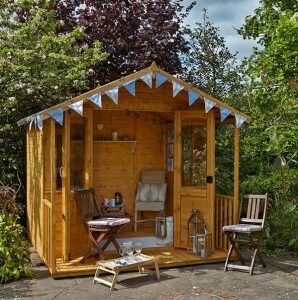 With its smooth good looks, overhang and that lovely little decking area, this is a summerhouse that really does have a very high quality and gorgeous look. It is very well made and with the materials used it is going to last many years and be able to take any abuse that the weather throws its way. While the price is not cheap, we do feel that it justifies its price tag very well. 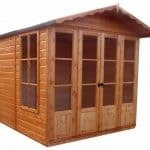 If you want a summerhouse that is high quality all throughout and is going to last you many, many years then this one here is one of the best that you can get.